Toss out the toxic red cherries. Home canned Maraschino cherries make the perfect cocktail garnish. We love cocktails! There’s nothing better than a frosty glass with 2-3 ounces of a shaken potion to celebrate the beginning of the weekend, or just the end of a workday. Bourbon, the sweet brown all American elixir, makes wonderful concoctions that will turn any vodka drinker into a whisky fan after their first sip. Depending on the origin of the brew, whisky is spelled with or without the “e” – as in “whisky” or “whiskey.” American whiskey includes that “e” but that isn’t the only difference between it and it’s counterparts across the Atlantic. American whiskies tend to be sweet by Scottish standards. Most are made from a mix of corn, rye and wheat and aged in oak barrels, though the time a particular whiskey spends on oak will vary from bottling to bottling. Of course, there are differences in the malting and distillation processes – the use of peat fired drying kilns and the smoke flavor it imparts to Scottish whisky comes to mind – differences that result in delicate nuances that make one whiskey best served neat, while another one may be mixed to make an ice cold cocktail and served up. While we could go into far more detail about the differences between whisky styles, and the whiskey making process, this post is about cocktails. More specifically, this post is about our holy trinity of whisky cocktails: Manhattans, Sazaracs, and Rob Roys. Makes one and can be doubled. Our favorite bourbons for this cocktail are Bulleit, Woodford’s Reserve, and Maker’s Mark, in that particular order. What makes the best Manhattan, aside from the one of the great bourbons mentioned, is the use of our own homemade maraschino cherries. We no longer buy those toxic red ones – they should be banned! 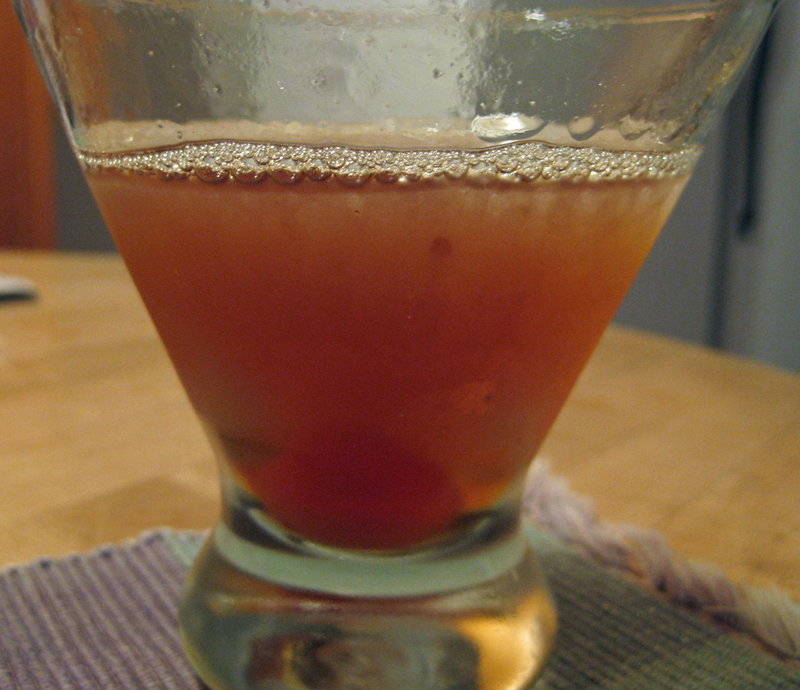 It’s easy enough to make your own with a good bottle of Luxardo’s Maraschino Liqueur and some fresh seasonal cherries. Spring is the perfect time to can a few jars of them to keep year round. 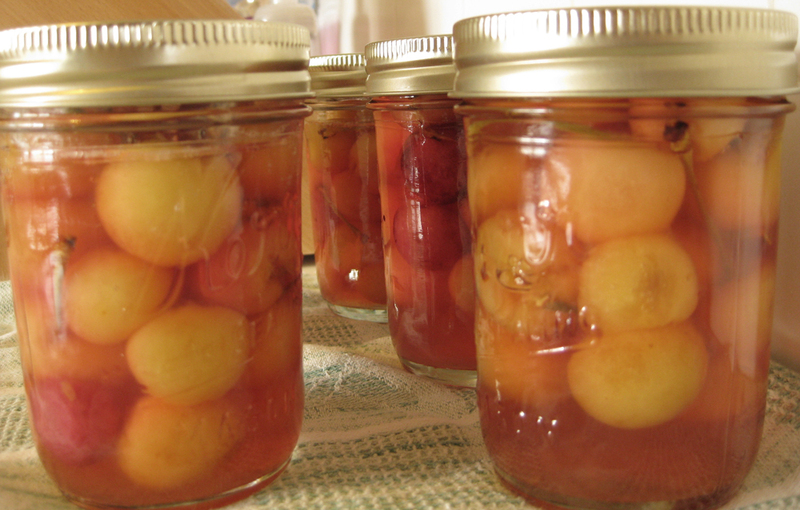 All you need to do is pit the cherries, add them to a sterilized mason jar (leaving enough space at the top so it’s not overfilled), pour in the maraschino liqueur and process in a water bath. You can also make a simple jar that will last a month or two in the back of your fridge. Pit the cherries add the maraschino liqueur and refrigerate for a day or two before using. A half hour before making the cocktail put the cocktail glasses in the freezer. Fill a cocktail shaker half way with ice. Add the bourbon, sweet vermouth, and bitters. Shake gently until the cocktail shaker becomes frosty. Place a maraschino cherry and 1/2 teaspoon of Maraschino liquor in the bottom of a chilled cocktail glass. Strain the drink into the glass and enjoy! Makes one but can be doubled. If doubling, mix each drink separately. We love this classic New Orleans cocktail! Our first experience of the drink came at the hands of the masters at Alembic and we’ve been hooked ever since. We regularly use bourbon in our sazerac recipe, but purists will tell you that this is a drink best made from pure rye whiskey. We’ve tried it with Wild Turkey’s 101 proof Straight Rye with great success. We’ve alternately coated the cocktail glass with absinthe and green chartreuse and like them both. The absinthe adds a spicy sweetness to the finished cocktail. The chartreuse is herbaceous and bitter making the cocktail slightly more complex but with a clean finish. 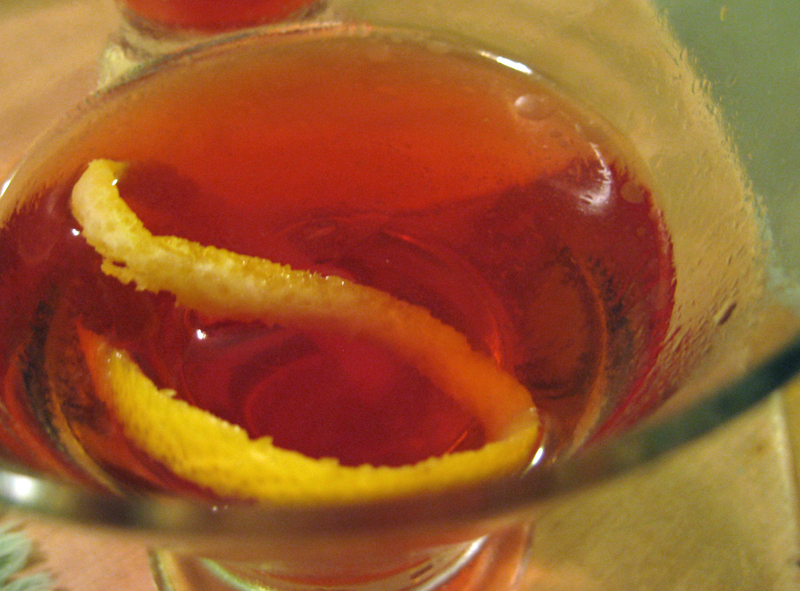 The “official” recipe for the sazerac is an historical mystery, but most agree that the original sazerac was a cognac-based cocktail. The absinthe or pastis came later as did the Peychaud’s Bitters most believe to be a necessary ingredient. When you do your research on the sazerac (and we know you will) you’ll find far too many opinions on what is and isn’t the right way to make the drink. Grain of salt, people! Stick to the basics but experiment where you want. For example, we’ve abandoned the Peychaud’s because we don’t like them – they’re artificially colored and they lack complexity – opting instead for good old Angostura bitters. But what do we know? Set serving class in freezer to chill. In a rocks glass, add sugar and bitters and stir until sugar begins to dissolve. Add bourbon or rye and muddle them until the sugar is completely dissolved (this takes time). Remove cocktail glass from freezer and add absinthe, turning glass on its side to coat the bottom and inside of the glass. To the bourbon sugar bitters mixture, add 2 or 3 ice cubes and stir until chilled. Strain into frozen cocktail glasses. Garnish with lemon twist using a citrus zester. Be sure to remove the twist of lemon peel over the surface of the cocktail so that the oils from the zest “spritz” over the top of the drink. Serve! after three I'm under the table, and four I'm under the host. Oh, to mix Scotch with anything other than a little water. Alas, there are several classic Scotch-based cocktails and we’re not entirely averse to pouring some Johnnie Walker Red or Black label over ice and then adulterating it with any number of mixers. With this cocktail you’ll use Scotch whisky and we recommend Johnnie Walker Red, sometimes Black, but never Gold, Green, or Blue, and don’t even think about adulterating a single malt Scotch with vermouth and bitters! If God doesn’t strike you down for such a grave transgression, a Scotsman surely will! 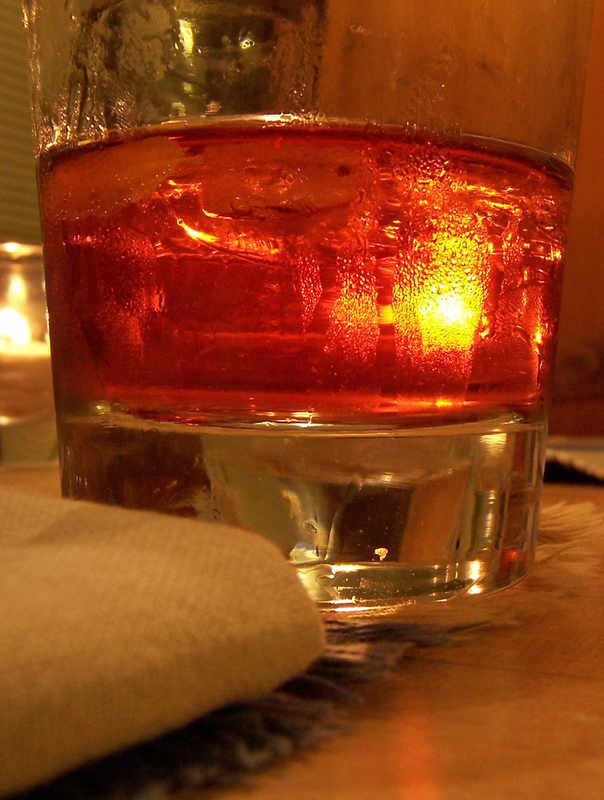 Traditionally, the Rob Roy is served “sweet” hence the use of sweet vermouth. But the cocktail may be made “dry” by substituting dry vermouth for the sweet. The “perfect” Rob Roy uses equal parts of both! Add ingredients to an ice-filled cocktail shaker and shake until the shaker turns icy. Serve up in a cocktail glass with a cherry (or lemon twist if using dry vermouth). « Older Post Frankly Speaking! » Newer Post Buckle Banter: Blueberries Rock Our Summer! It’s awesome to visit this website and reading the views of all friends about this article, while I am also keen of getting know-how.